Even if you aren’t currently taking a class at the Art Center, you can develop your art skills and make new friends by participating in one or more of our fun, educational weekly member groups. 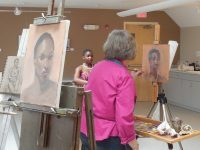 Every Friday morning from 9:30 AM to noon, our popular Friday Figure Group meets at the Falmouth Art Center. A clothed model is provided to give members a chance to practice depicting the human figure in the medium of their choice (bring your own supplies). 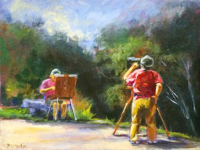 There is no instructor, but participating members are happy to provide guidance and critiques. Attendees are asked to make a $10 donation to help pay the model. 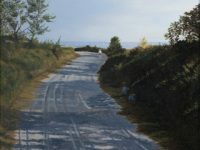 The Falmouth Art Center’s Monday Morning Painters group is a free weekly event open to members only. The group decides on a meeting spot in the Falmouth/Upper Cape area to engage in plein air (outdoor) painting. Participants meet at the same spot for two weeks in a row on Monday mornings from 9:30 to noon (when weather permits). There is no instructor, but all attendees are invited to participate in a group critique after each session, sharing helpful ideas and tips. Every Thursday from 4:30 to 6:30, members are welcome to attend our informal knitting group hosted by fiber artist and knitting instructor Carol Amaral. Carol is happy to assist with your current knitting projects and offer guidance so you can start a new project without fear. Members are also welcome to attend just for the fun and companionship that Sit & Knit provides. Sessions are $5.00 each (paid to the instructor at class time). No pre-registration needed; just drop in anytime. Every Monday from 9:30 to 12:00 members are welcome to come and paint here at the Art Center in an open studio setting. It’s a great opportunity to connect to other artists and take advantage of our facility. We have easels and tables you can use, but bring your own painting supplies. No advance notice needed; just show up if you want to paint! click here to learn more about our open studio for members who work in clay. Members may submit one piece to this non-juried exhibition which will be on display in the Hermann Gallery and the Landrau-Partan Gallery. For more opportunities to exhibit your work, click here for our exhibition schedule. For exhibition guidelines, click here.